Subways are a staple of horror. There are long, dirty, abandoned corridors. There are escalators which invite vertigo and all kinds of fatal accidents. There are the endless tunnels, much like the Haunted Castle, but with the added charm only a Water Level with poor lighting and escalating claustrophobia can bring. Full of unexplained echoes, dripping water, clanking metal and chains, and the earthquake-like passing of other (functional) subway trains overhead. There is the subway itself, which can be full of criminals, dangerously overcrowded or ominously empty. And let's not forget the platforms, which can be dimly lit and full of hiding places for all kinds of evil. Fights that take place here usually have the fight on the platform with only way out cut off and trains constantly passing by waiting to chunk the loser with a Gory Discretion Shot. Expect the Sinister Subway to be populated by monsters, mutants, vampires, alligators, mutant vampire alligators, and good old serial killers... or, alternativey, miles and miles of darkly lit, empty nothing. Where a Haunted Castle says "Victorian", the Sinister Subway says "art deco" or even "industrial", and can set the tone of this horror game or movie with the broken promises of an industrial age, rather than the forgotten splendor of a Victorian past. Vampire Princess Miyu, in one of the first episodes. Even after she finished exorcising the Shinma who'd made his home there, the place remained very, very, VERY creepy. Especially as she only killed the villain but did nothing to ease the suffering of his victims. Hayate the Combat Butler features one of these. It ended with a barely-fended-off stampede of rats. Considering it was The Ojou's first attempt at taking a subway, not surprisingly she never tried that again, sticking with nice, safe, normal private jet travel. Hellsing: Episode 7 of the first anime takes place in The London Underground, battling vampires and a particularly tenacious priest. The opening scene of Blood: The Last Vampire takes place in a subway. Subverted in that the person Saya was chasing wasn't actually a Chiropteran. Ga-Rei -Zero-: Yomi and Kagura are called out to investigate one of these, where Kagura has her first encounter with Category D's. Yomi warns Kagura that the subway is still active, and suggests she not touch the electrical conducting wire unless she wants a "really bad hair day". The Big O: Somewhat subverted, as, while the subways of Paradigm City are not used by the residents for fear that they are haunted, they are actually quite safe, and are used by the eponymous robot and Roger Smith for secret transport, however, below the subway are numerous "facilities" that are so scary, even Roger Smith doesn't venture that deep. Though it should be noted, that Roger has only mapped out the basic subway system, not the, undoubtedly numerous, auxiliary lines, branches, etc. that probably exist in the subway system. One episode of Pokémon Best Wishes showed Team Rocket running one of these and having Meowth pretend to be fired from them to lure Ash and friends into their subway to steal their Pokemon. During Garth Ennis' run on The Punisher, Frank occasionally had to deal to underground problems, like a gang of criminal midgets (which ended up with Wolverine getting his face and gonnads shot off then literally steamrollered) or a hobo army led by a man who lived in a giant pile of corpses (because it reminded him of the time his morbidly obese mother died on top of him, forcing him to eat his way out). The genuinely creepy and very well-written Supernatural fanfic Blood on the Tracks centres around, as the name implies, a Sinister Subway. Zootopia has an abandoned subway station, containing a subway car where Bellwether's hench-rams concoct the Night-Howler serum used to turn predators savage. Moebius is a Argentinean film that features as protagonist the Buenos Aires subway, the "Subte". An ambitious and peculiar layout that tries to connect all the lines ends in an entangling figure akin to a Möbius Strip that ruptures the continuum of timespace, situating the speeding train in a neverending loop out of reach from our dimension... with thirty passengers on board. Corrupt corporate executives and neglectful government employees are involved in this mess, and hire a topologist to fix the problem. Based on a 1950 SF story, A Subway Named Möbius by A. J. Deutsch. Death Line and Creep (2004), both horror movies set in The London Underground. Then there's Hobbs Lane Station in the film version of Quatermass and the Pit - not exactly abandoned, just closed for renovation, and the focus of unearthly events. The Matrix films. While they aren't quite "abandoned", they certainly have an air of creepiness to them. Cloverfield has a very spooky sequence in a subway tunnel, which climaxes rather frighteningly when the cameraman turns on the nightvision. An early scene of Jacob's Ladder has the title character lost in a New York subway station. Though he doesn't encounter anything supernatural, the atmosphere is almost unbearably dark and creepy. Spider-Man 3 includes a fight scene between Sandman and a venom-suited Spider-Man along the Subway tracks. Ghostbusters II has a Sinister Subway sequence with a Ghost Train to boot. And severed heads on pikes. Blade: Trinity has a toupe troupe of newly turned teenage vampires try to turn a local subway station into their own personal buffet. It would have worked if their first victim didn't have silver tipped knives and an energy bow. Inverted as the Turtles' new subway home is bright and cheery with elegant art deco styling and stained glass accessories. It's also played straight as April is attacked by the Foot in the standard "dark and dirty" subway. 28 Weeks Later has the heroes flee into The London Underground to escape an attack helicopter and the rampaging zombie horde. Naturally, it's full of bodies and only one person has night vision (on the scope of her rifle). The Hungarian film Kontroll. Before the film begins, a Budapest subway official assures the viewers that the subway is, in reality, perfectly safe. This was a condition for granting the filmmakers access to the subway. The Phantom of the Opera (1989): If we are to believe Robert Englund, if there'd been a sequel to his version, most of it would've been in an abandoned subway station. Luc Besson's Subway: Inverted. The subway system is a playing ground for some, and to others it's their home. An American Werewolf in London: Lucky Briton Gerald Bringsley gets eaten there by the eponymous werewolf. French film Buffet Froid is about a crime in the La Défense RER station in Paris. The Midnight Meat Train: Leon Kauffman, a photographer, is attempting to find the "real" New York City. He begins to delve into the city's inner "darkness", and while there, discovers a monstrous serial killer roaming the subways. The action of Mimic takes place mostly in a subway system. Stag Night, which is pretty much Wrong Turn IN A SUBWAY SYSTEM. The Tunnel, Australian based horror movie. Similar again, except that it is based on actual events prior. The government did stop talking about the reservoir mysteriously, and film crews do actually go down there where there is hard-to-find hobos. Then add a superhuman stalker who's afraid of the light and you have one very creepy movie. Which could've as easily occurred with a regular stalker. The subways of Daybreakers are infested with mutants. The hero of π, in the throes of a horrible migraine, experiences a nightmarish hallucination in the empty New York subway, in which he chases a bleeding man (who may be himself) and follows the trail of blood to a bloody brain lying at the foot of a staircase, which he probes with a pen, producing audio and visual hallucinations in his own brain. The film "Jacob's Ladder" has a very effective example of this. Fright Night 2: New Blood: One of the vampire attacks takes place in the subway. The main characters have to jump out of the carriage and walk along the tracks to escape. In Thirteen Women, Ursula coerces the swami into throwing himself under a subway train once she has no further use for him. The Pendragon Adventure has an abandoned subway station as the location of Second Earth's flume entrance. In Sourcery, the genie's fullomyth (a play on the filofax) includes a map of The London Underground with the hidden stations most people don't know about. It's not shown, but presumably they have at least a passing resemblance to the Sinister Subway stations. Knifepoint Horror: The story "tunnel" deals with some very strange happenings on a DC metro train. Neverwhere's London Below, which is essentially where everything that has ever slipped the cracks in the real world goes, has a few scenes with abandoned stations. Clive Barker's short story The Midnight Meat Train, has a subway where you can be murdered to be fed to the Elders of New York. The whole point of Dmitry Glukhovsky's novel Metro 2033, where the Moscow Metro stations became shelters for a few survivors after The End of the World as We Know It, with all manners of nasty stuff lurking in the tunnels. All this makes communication between stations quite risky and outright dangerous, naturally setting up The Quest. Taken Up to Eleven on a canon Alternate Universe novel, where Moscow is A-OK but something turned the metro into a horrifying localized Death World hell-hole just as bad (if not worse) as canon. In Rogue Male a fight to the death in a deserted tunnel of the now-disused Aldwych London Underground station ends with the "hideous, because domestic, sound of sizzling." In Valiant, the protagonist makes her home in an abandoned subway station with some companions. Considering they are variously disturbed children doing Faerie drugs, they are the REASON it's sinister. In Stephen King's The Drawing of the Three from his The Dark Tower series a major plot theme revolves around Jack Mort, a homicidal maniac designated "the Pusher," who lurks in subways and pushes people onto the tracks in front of oncoming trains. (Among other vicious crimes.) Odetta Holmes falls victim to him and loses her legs at the knees in backstory, spending the whole series in a wheelchair. Roland takes control of Mort's body and throws him onto the tracks, under an oncoming train. In Kane story "At First Just Ghostly" an abandoned tunnel of London underground is the place where burnt-out writer Cody Lennox meets Satan himself. An unfortunate young man, after a pub crawl, ducks into a curiously tatty and ill-lit Tube station and boards an oddly dilapidated train in one of the short stories in The Wreck Of The Lodewijk. Sir John Betjeman's South Kentish Town was a short set in a closed London Transport underground station, after a clerk gets off the train when the doors malfunction and open at the disused station. The train leaves before he can wonder where he is, leaving him alone in the dark station, unable to leave as any portals in the station to the outside world have been built over and forgotten. John Wyndham's short Confidence Trick has a man get on an underground train from Bank Station amongst a crowd, but then realises the train has only 3 people on board, and has been rolling for more than an hour at full power without getting anywhere. Pulling the emergency brake does nothing; the train stops at a terminal at midnight where a voice calls "All Change, End of the Line", where they are met and guided on by a demon. Conrad Williams' London Revenant deals with drop-outs who haunt the underground; among them a Pusher similar to the Stephen King example above. Tobias Hill's Underground involves a search down disused tunnels, makeshift passages and locked/forgotten stations regarding a series of murders. A psychotic film-maker murders passengers and lives in an abandoned station on the Tube in Nicholas Royle's The Directors Cut. Harry Harrison's The Last Train involves a man going down into a station and finding himself apparently back in time - or is he among ghosts? The people there don't belong in the 70's when he enters the station - they appear to be sheltering from bombs during the Blitz. The Eighth Lamp is set during the First World War, in the fictitious Cheyne Road station on the London Underground. As he turns off the lamps on the platform one night he sees a Circle Line train that shouldn't exist. No-one believes him, but the next night he sees the train again and confront the reason it appears. 24 positively adored this. Many times they took advantage in the Los Angeles subway's middle-of-the-night 90-minute break to blow it up a few times. The Doctor Who episode "The Web of Fear" sees an alien menace invade The London Underground. With robot yeti. Primeval episode 2. No serial killers though, just some giant spiders and a giant carnivorous Arthropleura. A TV Movie called The Undead Express, features a group of vampires in New York who live in an abandoned station. The opening titles of the TV movie version of The Sunset Limited are set over an ominous sequence of shots of a scary and apparently deserted (but real) subway station in Harlem. The title sequence of The Equalizer also played up the New York subway system for all its crime-ridden menace. Starling City in Arrow has an abandoned subway system. An episode of Police Rescue featured a search through various tunnels leading out of the rail tunnels for two kids who tired of a delay and decided to leave the train while it was still underground. The Jam Down in the Tube Station at Midnight. The Jam's 1978 single graphically describes an immigrant being chased and beaten up by racists in a London underground station. It was banned from radio airplay by The BBC. The Cure 'Subway Song' is about a woman walking through the subway at night with the feeling that she is being followed. The track ends in a haunting scream, implying that she has been attacked. Ghostbusters Pinball (a digitally rethemed version of Haunted House) turns the lower playfield into the haunted subway from Ghostbusters II. GURPS: Metro of Madness is set in a subway designed to attract Things Man Was Not Meant to Know. Act 3, Scene 1 of The Saint of Bleecker Street is set in a dim passageway in a subway station. Inverted in Linie 1, a German musical from 1989, set in the Berlin subway. The subway queue line in the former Kongfrontation attraction at Universal Studios Florida was purposely designed to look very ominous, in order to create a sense of dread. In a way it's also justified, as the ride was set in 70's NYC, when the subways were pretty shady-looking. The also-defunct Earthquake: The Big One attraction, much like Kongfrontation, had its subway setting purposely designed to evoke a sense of dread long before the earthquake portion comes in. The haunted house Terror Underground: Transit to Torment from 1995 took place in one of these, being based on the urban legends about people born and raised in the tunnels. The first Doomsday took place in the New York subway, where the worst of the city's population had hid to escape the Millennium Bug. One of the missions in Alpha Protocol involves Mike fighting/sneaking through the Taipei subway system while Chinese Secret Police agents try to stop him, in order to get information on the assassination plot. It eventually turns out that the CSP agents are actually working for a double agent who is working with the Taiwainese government to prevent the same assassination, but are convinced that Mike is the killer. In Batman: Arkham City, Batman has to go through one in order to find Wonder City. The first dungeon in Breath of Fire: Dragon Quarter takes place in a network of subway tunnels. Part of Broken Sword 2 takes place in the (real life) abandoned British Museum tube station. The Call of Duty: World at War level "Eviction" ends with a semi-lit shootout in a dark, dank Berlin metro tunnel, with occasional pauses in the fighting due to flickering lights. The level ends with the Nazis flooding the entire networknote The Nazis really did flood an S-Bahn tunnel which was linked to much of the U-Bahn network in the last few days of the war in an effort to stop you, drowning scores of their own troops in the process. The multiplayer map "Station" is similar, though brighter due to the fact that the tunnel has partially collapsed. New Praetoria maps for the Going Rogue upgrade to City of Heroes have large underground subway tunnels filled with the usual roving gangs of bad guys. Condemned: Criminal Origins has one populated by crazy hobos, emo morlocks, Kayako Saeki lookalikes, and freakish firemen with sledgehammers. The fourth level of Descent 3 has you dodging trains in the futuristic subways of Seoul, Korea. Deus Ex has an abandoned subway section as well, but it's just full of (otherwise) homeless people - which is Truth in Television, as abandoned sections of the New York subway are often occupied by sizable homeless communities. Duke Nukem 3D: The "Rabid Transit" level is set in one. Fallout 3: A great number of quests take place in the Washington D.C./Arlington, VA subway lines. Which are filled with Feral Ghouls (read: slavering zombies that run really fast), mole rats (scarier than they sound) and psychotic, sadistic Raiders. Fallout 4 features similar situations in the former Boston subway lines, one of which houses an unfinished Vault that's been occupied by gangsters. There's also the Mass Pike Tunnel, which is part of the abandoned roadway network, but has the same hazards. Averted with the Third Rail, a nightclub established in the former subway station below the Old State House in Goodneighbor. F.E.A.R. Extraction Point (the Expansion Pack) had "Descent", its longest chapter, set in a Subway system (along with some storm drains). Part of Project Origin involves moving through a city's subway system after The Squad's driver is forced to veer into a gap in the street to avoid a massive assault by Replica troops. For the most part the subway system is abandoned, save for the hundreds of Replica troops combing it for you specifically. The second level of Final Fight takes place in a subway. You eventually brawl your way through a moving train before reaching the arena where you fight Sodom. Half of the first level in Ghost Sweeper Mikami: Joreishi wa Nice Body, for the Super Famicom. Inverted in Hellgate: London, where The London Underground is the only place NOT infested with demons. There are still infested portions outside the stations which, depending on the random load-out of enemies, can be more or less sinister. Hellnight, a Japanese first person video game about being trapped and unarmed in the maze-like Tokyo subway system, along with various other scattered survivors, while being hunted down by a demonic creature. Did we also mention the serial killer running around? In MapleStory, the subways under Kenning City are infested with Stirges, Wights, and Specters; it's still in operation, but the player seems to be the only one who ever uses it. Left 4 Dead: The second level of the "No Mercy" campaign takes you through subway tunnels. One of the dungeons in MapleStory, populated by blue slimes, snakes, and later, ghosts. Also home to one of the most annoying jumping puzzles ever. Max Payne: After the depressing opening level, we skip forward a few years, as Max is meeting up with his DEA partner in the Roscoe Street subway station... but the station is deserted, and the platform exit is locked. Then, if the player is paying attention, they'll notice a spent shotgun shell lying on the platform. From there, it only goes From Bad to Worse. The fragmented remains of the Moscow metro system, full of toxic air, radioactive water, monsters of all kinds and some other unpleasant "inhabitants", is the setting of Metro 2033 and its sequel Metro: Last Light, as per the original novel. The second part of the fifth mission from Metal Slug 2/X takes place in a subway system occupied by the Rebel Army. Here, the player fights both the Rebel soldiers and speeding subway trains that try to crush you. One of the stages in Mortal Kombat 3 is an abandoned subway station, whose stage Fatality, appropriately enough, involves uppercutting the opponent to the tracks on the other side and watch as the train (which was never there before) tramples them. If you uppercut your opponent during the match, however, they'll go up to the Street stage. The stage was revamped for Mortal Kombat: Armageddon: now the trains pass by periodically, and the opponent can be dropped into the tracks mid-round, while the player is treated to a much more realistic and graphic death cinematic. It comes back in Mortal Kombat 9. No More Heroes has Travis fighting Mooks in the stations and trains of an abandoned (but still functional) subway system a few times. He falls asleep on one train and dreams a Shoot 'em Up minigame. Persona has one as one of the early dungeons. And Yog-Sothoth is the boss fight! Persona 5 has Mementos, the Palace of the public. It consists of an endless, shifting labyrinth of twisting tunnels infested with Shadows, howling winds described as screaming, with veins running along the walls into the depths below. Sailor Moon: Another Story features this very early on in the game. However, it is only populated by a couple of level-boosting enemies/bosses. Also, it's a regular train station. Secret of Mana has a subway station populated with zombies. An early level in Shadow Hearts: Covenant takes place in abandoned tunnels of the Paris subway, complete with Gothic Horror monsters and enemy Mooks. Shadow Man: One level is through a crashed and bashed subway system in order to get to Jack The Ripper. No, really. Shin Megami Tensei III: Nocturne had a lot of these, which were usually the entrances to long, annoying dungeons. Silent Hill contains a short one, but had all the aspects, including filthy flowing green water, giant chain fences with large gashes, human shaped lumps in the sewage, and short, squat, brown monsters who made horrifying noises in the European version and creepy frog-like burps in the US version. Silent Hill 3: With the abandoned subway station that wasn't there yesterday! Silent Hill 4: Includes a maze of half opened and closed subway cars... populated by unkillable ghosts who could phase between cars and caused you damage with mere proximity. Fun times. Si N has several levels taking place in a fictional subway system. The first mission of Soldier of Fortune is in the New York subway. Mission 6 also has a subway tunnel with electrified rails. The plot of Splatoon 2's Octo Expansion takes place primarily in the Deepsea Metro, an old subway system that transports you to a series of test chambers. The ''Spider-Man game for the PS1 had a level where Spidey had to ride a moving train from one station to the other. He gets attacked by an endless horde of lizard people for some reason. The Midnight Station has this in spades as the entire game seems to revolve around a creepy abandoned train station platform located in the center of an Eldritch Location. The website capitalizes on this in spades. Tomb Raider III had a level set in The London Underground's Aldwych subway station. Transarctica has the underground tunnels, which can be very useful as shortcuts to distant locations, but their inhabitants, savage tribals called the Mole Men, have the nasty habit to ambush trains passing by. This can result in heavy losses in manpower and resources, but on the other hand it's an opportunity to catch fresh slaves. In the name of humanity's salvation, of course. The Washington DC subways are the location of the first mission in Syphon Filter and the last mission in Syphon Filter 3. The fictional town of Carthage in The Omega Strain also has a subway.The bottom of this page includes a description of it. The fourth level of The World is Not Enough for the Nintendo 64 (which, in a subversion, has occasional bystanders and operating trains). An extended sequence in The Matrix: Path of Neo takes place in a train station similiar to the first movie - except that it's lights are even poorer and rats are seen running about on the floor. Inverted in Half-Life 2 Episode 1. After a long and harrowing journey through the tunnels and collapsed buildings under City 17, reaching a subway station is the sign that you've reached the surface. In Beneath a Steel Sky, LINC is reachable through an old subway tunnel. There is also a monster lurking about there. The third Exmortis game has you escaping into one of these to take shelter from a nuke that goes off on the surface. It's plenty creepy - with an Eldritch Abomination stalking you and playing with your memories, you have to manually restart a train while avoiding booby traps, and there's a cannibal living in the tunnels. World of Subways 4 - New York Line 7 invokes this during the Secret Level, "Midnight": You have to walk through an evacuated subway sector to find the missing parts for its respective train... while hiding from an unseen Serial Killer at the same time. The "Sinister" part gets even more so whenever a Jump Scare cue prompts you to deactivate your flashlight and stay still. On his way to fight the "Big Bad", the protagonist of Chaos;Head goes through this. He hallucinates, thinking that there were enemies blocking his path, which makes the trek through the subway scarier. The music doesn't help to alleviate the suspense. In G-Senjou no Maou, one of the endings features this as a "Final Battle" stage. In Autumn Bay, Stephen, Adam, and Callie investigate a series of abandoned subway tunnels . In episode 3 of The Autobiography of Jane Eyre, Jane has a terrifying experience with the bus version. The bus terminal is very creepy, and she's actually at the bus stop in the middle of nowhere. It's late at night and she lost her mobile, so she can't contact anybody. Also the person supposed to pick her up didn't show. The video description reveals that they mixed up the times. She freaked out, but survived and was fine. The Disney cartoon American Dragon: Jake Long has the Huntsmaster's lair like this. In the episode "Knock Knock", The Real Ghostbusters and the entire Big Applesauce have to contend with subway trains and graffiti turned into monsters. On one occasion the busters board a subway car, the lights go out, and when they go on again they're surrounded by undead skeletal passengers. In the Batman: The Animated Series episode "The Clock King": Gotham citizens first laugh at Mayor Hill when the ceremonial first train to Gotham Central Station doesn't arrive when he announces it. Then they hear Fugate's voice asking them to "clear the platform", and the lights of two trains at one appear. Everyone panics. In the Adventure Time episode "Mortal Folly", the monstrous Lych's Well Of Power is in a ruined subway station complete with undead skeletal passengers. In London, Aldwych station and the closed Charing Cross Jubilee line platforms are still relatively intact and are rented out for filming every now and then. Wikipedia has a list of similarly abandoned stations. Lower Bay station in Toronto sits empty in its Sinister Subway aura 90% of the time...except when it's being used for filming (it even has its own collection of MTA signs to make the station look like New York), being opened to tourists once a year, or being turned into a Genre Savvy piece of installation art . Berlin is this trope's codifier, if not even Trope Namer. Berlin gave birth to the word Geisterbahnhof after all, meaning "ghost station" or "haunted station". When the Berlin Wall was erected, the GDR closed East Berlin subway stations at lines running from the West through the East back into West (modern-day U6, U8 and the North-South S-Bahn) and secured them with all handy technological and of course personnel measures (read: armed guards) to combat any remote possibility for republic flight. When a subway train from the West slowed down at said stations, passengers could pick up the silhouettes of the armed guards in these darkened closed station, looking like ghost, hence the name. Of course, all said stations were renovated and reopened after Hole in Flag made their raison d'être obsolete. Paris has the Haxo subway station , the only intermediate station on a line built initially in the 1920s as a connection between lines 3-bis and 7-bis, but later abandoned on account of being considered superfluous. Not so sinister, as special trains packed with enthusiasts stop there every now and then. Stockholm, meanwhile, has the Kymlinge station , which was never opened, connected with the legend of the Silverpilen ghost train , a subway train meant for testing that was left unpainted and occasionally used as backup: according to legend, Silverpilen would stop at the Kymlinge station to pick up the souls of the dead, and if a living person boarded the train, he would disappear forever or get off several years afterwards. In Singapore, one station on the North-East Line, Woodleigh, was built and completed in the early 2000s but never opened due to lack of much commercial or residential developments nearby (another station that was left unopened, Buangkok (not to be confused with Bangkok), created much controversy and was finally opened a few years later). The kicker? The station is built under a former cemetery. Another station on the still-under-construction portion of the Circle Line, Bukit Brown, is being deliberately left half-finished (and obviously will not be opened), with just ventilation shafts marking the location of the station on the surface. The station is built as a provision for a future residential town that will be built in the area. And the kicker here? That area is yet another cemetery that has not been cleared or exhumed yet. Rochester, New York has one , which is surprising given the city's small size. The subway opened in 1927 but was plagued by inadequate resources and the growth of the automobile industry. It was closed after World War II but its wonderfully creepy ambiance (complete with an underground pool and pitch-black passages with no natural light) has made it a favorite of urban explorers and photographers. It's also homeless central. The Belgian city of Charleroi had its own subway system built despite being way too small (pop. around 400,000 and dropping) to ever make running it remotely profitable. A result of insane Belgian politics allocating equal amounts of money to infrastructural projects on both sides of the language border (the north built a port that still serves its purpose). The original plans included 8 metro lines, only 3 were built, and one of those was never used despite being fully completed. As a result, some tunnels and stations have been decaying over the past 25 years without ever having seen any train passing, although they are fully operational, including working signage and, occasionally, even the escalators. Unsettling . Madrid Metro has the Chamberi station , that was closed in 1966 as it was too close to other two of the same line. During some decades, as trains slowed down when crossing it, it was possible to see from them 60's vintage stuff (advertising, posters, turnstiles, etc). It was re-opened in 2008 as a museum. A better example, however, would be the Arroyo del Fresno note Ash Stream in English station. It was constructed to serve a proposed housing development, but never opened as said housing didn't materialise in time and the area around remained very sparsely populated suffering vandalism as a result. It's expected to open it in 2019, twenty years after other stations of the same line. Chicago has the abandoned tunnels of the Chicago Tunnel Company , a narrow gauge railway under the streets of Chicago. Built to remove debris during the installation of underground telephone cables, it was later used to make deliveries to downtown businesses and remove ash from buildings with coal-powered furnaces and boilers. 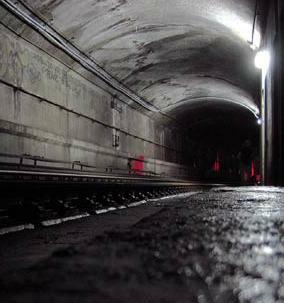 Many parts of the route were replaced by subway tunnels. The rest was abandoned after the railway shut down in 1959...and rediscovered in 1992 when a pile being driven into the Chicago River penetrated the ceiling of one tunnnel, flooding the remaining network (and the basements of buildings still connected to it) with over 250 million gallons of water.